I have some great pictures! Please click "Read More," then click on the pdf icon to open the story and photos of Franc's front yard. 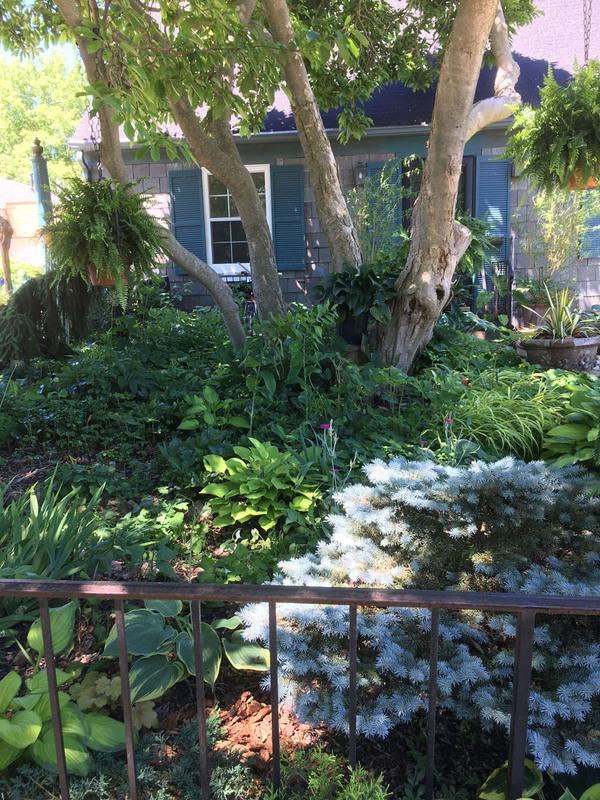 My grandmother had almost no front yard, but her back yard was spacious. There were trees, paths, a grapevine, flowers of types too numerous to count, berries, vegetables, and even a chicken coop with chickens who would bite my ankles when I was sent to collect the eggs. This was all within the city of Muskegon, MI -- I wish I had photos but alas. I do not. Oh and her house was one of those houses that one ordered from the Sears Roebuck catalog. She was also very frugal. Muskegon was an hour south from Ludington, where I grew up. My parents would occasionally drive us there on Friday nights - stopping for dinner at the Goody-Goody in Whitehall for supper. Then we would shop downtown Muskegon. I always bought new pencils at Kresge's. I remember the pet department at Kresge's - all those poor birds and turtles jammed in cages. And yes to the Sears catalog houses ... I live in one now! Still a sturdy, logically-laid-out house. I think most of the houses on my street were Sears houses, and at 1400 square feet - we have one of the biggest! I am sorry that the website was off line for a while.